The Row has partnered with Moved to provide you with a free personal assistant to coordinate your entire move. The Row has partnered with Premium Insurance to offer residents a preferred group rate! Open-concept floor plans make way for all the style you want in your new apartment home at The Row. Whether you’re looking for a space of your own or a place to call home for you and yours, our interiors offer all the room you need for you to feel comfortable. Step out onto your private patio or balcony for some serene time outdoors. Enjoy the convenience of having all the appliances you need already there for you when you move in, from a washer and dryer to a refrigerator, dishwasher, and range in the kitchen. Call us today to schedule your personal tour of our apartments for rent in Kent, WA. Choose from a variety of floor plans in our Kent, WA, apartments for rent to find the size and feel that fits you best. The Row offers studio, 1, 2 & 3 bedroom apartments to give you options when it comes to choosing your next home. Our 400 square foot studios are perfect for those looking to live on their own with their pet by their side. 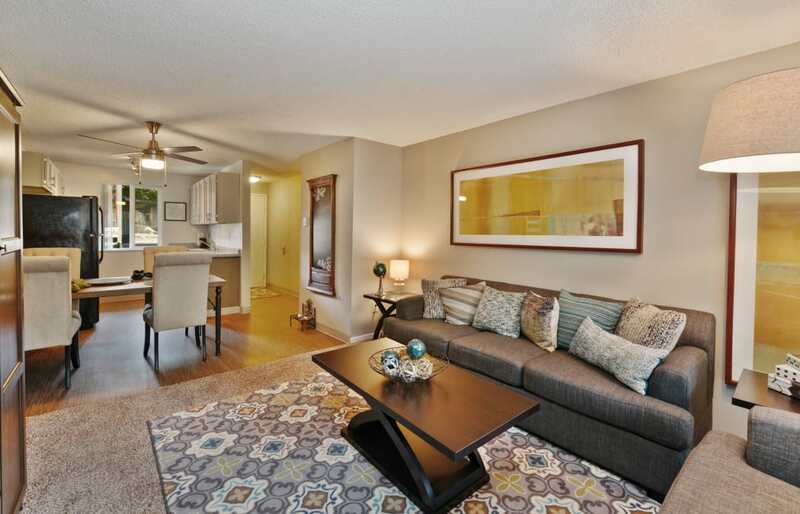 Our 1 bedroom apartments offer a generous 700 square feet of space, while 2 bedrooms provide 800 square feet. Our 3 bedroom apartments provide 980 square feet if you’re looking for even more space. All of our apartments include a private patio or balcony to extend your living area outdoors.